Super Tasty and Very Healthy! 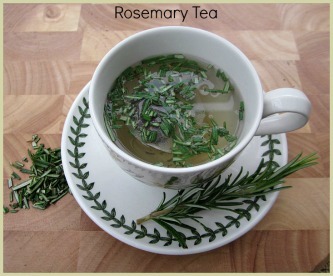 Out of all my spice and herbal drink recipes, rosemary tea is definitely one of my favourites! And if you use the fresh leaves, you only need a small amount for a healthy tasty cuppa. Like most other of my recipes, if you haven't fresh available, you can always use dried. My preference has to be for fresh, and if you grow rosemary plants, easy to do incidentally, you'll always have some available. Remove the bag and enjoy! If you chopped them finely enough, you can drink the fresh herbs without straining. If you prefer; you can pour into another cup through a strainer. Like all herbs and spices, both dried and fresh, rosemary tea comes with a whole host of health benefits! When you use it in your cooking, you'll get the tasty flavour, but in the process it may nullify some of the healthy goodness that comes with this herb. But using in a drink, you get the well-being benefits and the flavour! Note: To get the healthiest leaves for your drinks and culinary recipes, why not have a go at growing it? See detailed steps, tips and advice on how to grow this herb. Image links to Other Recipes You May Enjoy!